This Frontier Needs Heroes have spent the past 5+ years playing shows all over the world. Just a guitar and their voices, logging thousands of miles in their car, touring the greatest cities of North America and Europe, selling one record at a time, making one fan at a time. This determination and DIY ethos brought them on an epic journey around the world, playing in clubs, houses, and festival stages. After two successful albums under their belt in which they explored their stripped down alternative folk arrangements, This Frontier Needs Heroes decided to try something different. The name of the band, a reference to Woody Guthrie’s famous WWII-era guitar graffiti “This Machine Kills Fascists” didn’t just apply to its core members, but it’s also an invitation for everyone to become a hero in their own right. Their new album Hooky, recorded in the summer of 2012 on 2 inch analog tape at Dr. Dog’s studio in Philadelphia with the help of Loveland Recording’s Nathan Sabatino, was made with the contribution of a full band, making Hooky their most richly realized and, yes, hookiest album to date. 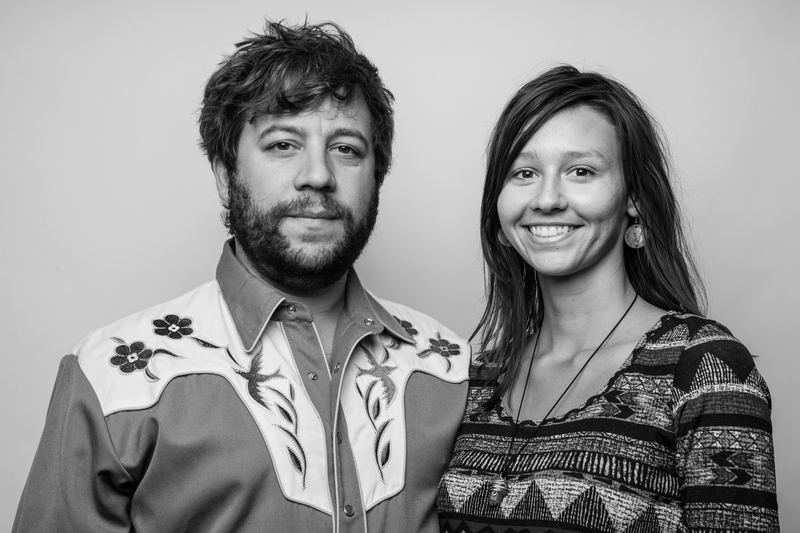 Brad and Jessica’s harmonies and vocal interplay, a key ingredient in their sound, are preserved, but the inclusion of additional band members — including players from O’Death’s David Rogers-Berry (drums) and Robert Pycior (violin), The Blank Tapes’ Matt Adams (electric guitar), Golden Boots’ Nathan Sabatino (organ), bassist Turner Stough and sitarist Arvid Smith — brings a breadth and depth to their already rich and elaborate sound. Just adding more members wasn’t the only change for the band. They experienced a change in geography, with Brad leaving Brooklyn and moving to Jacksonville, FL to work at a music venue while Jessica stayed in Brooklyn to focus on film/video projects. The change in latitude provided some challenges, but also a lot of new opportunities. While living in cities 1,000 miles away, they both did their final overdubs remotely, and would email and layer their individual tracks. That technique creates the albums hazy and reverent beauty which is an integral part of its aesthetic. That sound fits well with the lyrical content that conjures a range of images- sandy beaches, warm afternoons spent on the family farm, and varying conundrums of human culture. TFNH’s songs are both whimsical and heartfelt, reflective and uplifting. Even as the band’s sound has grown, their core of vivid, memorable and authentic songwriting has remained. Lead track “Hooky” acts as a double entendre, touching in its swinging, catchy melody and a critique of those leading an inauthentic life — they’re playing hooky on themselves by not doing what they are meant to do. “George Clooney” is a charmingly plainspoken ballad about the ubiquity of loneliness and the attendant desire for escapism, but the necessity to resist. It was inspired by reading an article about how George Clooney was arrested for standing up for what he believes in. The pondering strings of “Down on the Farm” help spin a narrative that grieves for the ghosts of a bygone era while searching for a lifetime love in the present. “It’s Over Now” mourns for a broken relationship, over staccato drums while finding a surprisingly natural place for sitar in a folk composition. Hooky evokes the full complexity of the human experience while it shines and shimmers like the sun off of those end of summer waves. The Frontier Needs Heroes appears on WXRY Unsigned LIVE from The British Bulldog Pub on Sunday. Posted on October 28, 2015, in News and Announcements and tagged British Bulldog Pub, Columbia, live broadcast, SC, This Frontier Needs Heroes, WXRY Unsigned. Bookmark the permalink. Leave a comment.